E.P. 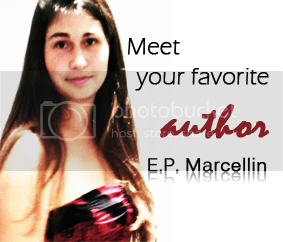 Marcellin was born in Western New York in the spring of 1986. Two years later, she moved to Nigeria with her parents, where her two younger siblings were born. Throughout her childhood, she moved back and forth between New York and Nigeria, and then Senegal. The family also traveled through some of West Africa and Europe, the latter inspiring a love of history in Marcellin that she draws on in her writing. Creativity and imagination were nurtured by both of her parents, her mother as an artist (visit her website), and her father as a storyteller. Every night was a new adventure as he made up stories about the family and their giant who would carry them all over the world in his shirt pocket. And her mother never allowed anyone to force her children to color inside the lines! Marcellin started writing stories as a young child, mostly about talking animals. At about twelve years old, she discovered the world of fantasy in Terry Brooks’ The Sword of Shannara and Lloyd Alexander’s The Chronicles of Prydain and it captured her imagination. When she was 16, Marcellin traveled to Saint Lucia where she was a bridesmaid for a family friend. It was this trip that inspired the first stirrings of the ideas that became Marcellin’s first novel, Element Keepers: Whispers of the Wind. She started writing it that summer, putting the project mostly on hold during the school year, but returning to it the following summer. It happened to be a very eventful year in her life, as her father was diagnosed with leukimia, and she reconnected with a boy she had met in Senegal, her future husband. Throughout her father’s battle with cancer, she found an escape in the world she was creating. Her father recovered fully and was so interested in the the developing story that he paid her for each chapter she wrote in the summer, freeing her from the necessity of a summer job so that she could continue writing. About halfway through, she finished high school and gave herself a trip to Italy as a graduation present, where she found both inspiration and personal fulfillment walking the same stones as Caesar and da Vinci. Marcellin attended Houghton College in the fall, where she studied writing and art, concentrating on creative writing and ceramics. After completing Element Keepers, she used it as her senior writing project, taking an entire year to edit and fine tune the manuscript, with both peer and professorial critiques. The month after graduation, she was married and moved to Canada with her husband, a commercial pilot. After being submitted to a few fantasy publishers, Element Keepers was accepted by Tate Publishing. 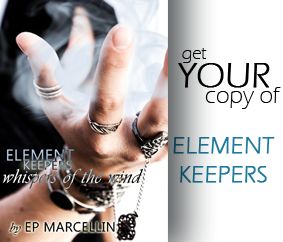 The process of publication took about a year, but in the fall of 2010, Element Keepers was released as a paperback. The dream of publication realized, Marcellin is very excited to continue weaving words and worlds. She also hopes someday to venture into the realm of film-making, another childhood dream. E.P. Marcellin attended Houghton College for a BA in Creative Writing with a minor in Art. Born in the USA, she spent most of her childhood in western Africa. Her family moved back to the USA during her teenage years. As time passed, she remained an avid traveler and book enthousiast. She found inspiration for Element Keepers while visiting Ste. Lucia for a wedding. Later on, her travels through Italy and Morroco also fueled her creativity, providing the final touches to the story. Today, she enjoys cooking, gardening, and artwork, when her little children give her the time. The growing family lives in Canada, where her husband works as a commercial pilot.